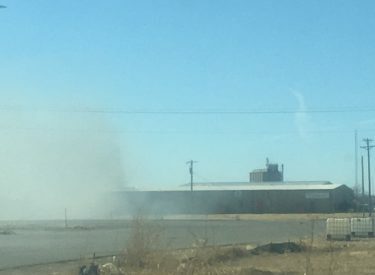 At 1:51 pm Tuesday, Liberal firefighters were dispatched to 441 Industrial Ave. for a reported structure fire at the Mosaic Service Center. On arrival firefighters encountered a wooden storage shed fully engulfed immediately against the South side of the main building. The fire was controlled within minutes of the arrival of the first engine and a supply line was laid in from a nearby hydrant as a precaution until it was confirmed that the fire had not spread into the main building. The fire had directly affected the South wall and firefighters opened both interior and exterior portions of the wall to fully extinguish smoldering insulation and structural members. The fire appears to have started due to improperly discarded smoking material and is believed to be accidental. The Liberal Fire Department responded with a total of 18 personnel and two engines. Also assisting at the scene was the Liberal Police Department & Black Hills Energy. No injuries of any type were reported. All units were fully returned to service at 3:37 pm.